Sherlock Holmes and Dr. Watson are called upon to solve a mysterious case involving the vile Lord Blackwood and a series of murders happening around London. I'll admit, I went into the theater not expecting much from Sherlock Holmes, as the trailers made the script seem cheesy and the character not being well, Sherlock-y enough. Luckily, I was proven very, very wrong. Sure, the film has taken some liberties with the characters and their motivations, but the overall spirit of a Holmesian adventure is here and man is it fun! The film is being touted as an action-adventure movie, but I would argue that it definitely falls more on the "adventure" side of things. While there are certainly a few set pieces and fist fights the film's real strengths lie in its pacing and story. 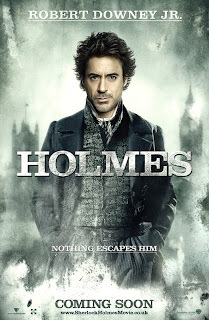 Clocking in at nearly 2 hours and 20 minutes Holmes uses his time wisely and it never feels like any sequence outstays its welcome or is a simple contrivance of the plot. The film moves at a clip, keeping you entertained and up to date but never dumbing things down for you. Which brings me to the story. The story here is complex without being overly convoluted and manages to wrap (mostly) everything up with a tight little bow at the end. It was also nice to see a film that didn't wink at its source material every few minutes or reference something in pop-culture. Holmes plays it straight and is all the better for it. Guy Ritchie really surprised me in that area and it really strengthens the film. That being said, all the characters are here and mostly true to their roots. Yes, even Sherlock's more um, worldy activities are put to use here and the action is explained with why Holmes would even know that. And the best part is that it makes sense. He uses his intellect to detect weak points on his enemies and exploit them. Not just run in, guns blazing as the trailers seem to be. Overall, Sherlock Holmes is a blast and a half at the movies and is really what Kingdom of the Crystal Skull SHOULD have been. The trailers were very misleading and may have soured a lot of you (myself included) from the get-go. Which just goes to show, you can't judge a literary character by its stylized reboot.